As summer and higher temperatures approach, employers should plan how they will reduce the risks of heat exposure faced by their workers. Those steps include gradually increasing shift lengths so workers can adapt to hot environments, providing frequent water breaks, allowing ample time to rest, and providing shade. We want to hear how employers and safety professionals keep workers safe from extreme heat. 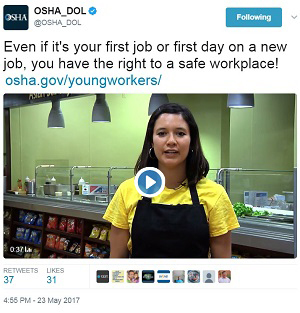 Tweet your photos or links to @OSHA_DOL with the hashtags #WaterRestShade #ProTips or email your stories to OSHA.QuickTakes@dol.gov for possible inclusion in a future issue of QuickTakes. Join OSHA and its partners June 12-18 in a nationwide effort to raise awareness on the value of workplace safety and health programs. During Safe + Sound Week, organizations are encouraged to host events and activities that showcase the core elements of an effective safety and health program – management leadership, worker participation, and finding and fixing workplace hazards. 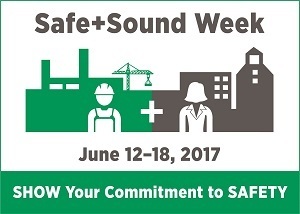 Visit OSHA’s Safe + Sound Week page to view videos and a recorded webinar on how employers can participate. The page also features sample activities, social media resources, and an interactive map where you can add your own Safe + Sound Week event to others occurring across the United States and in other countries. For more information, read the news release. Last month Governor Sam Brownback signed a proclamation officially recognizing Safe + Sound Week throughout the state of Kansas. On May 16 a tornado created an 18-mile path of destruction near Elk City, Okla. As the community began to repair the damage, OSHA’s Oklahoma City Area Office reached out to help protect clean-up and recovery workers. Compliance assistance was provided to roofing contractors, construction clean-up crews, volunteers and homeowners in both English and Spanish regarding various hazards. OSHA personnel provided guidance concerning fall protection, the safe use of chain saws, the proper use of ladders as opposed to free-climbing trees, and the use of hearing and eye protection while using chain saws. To learn more about keeping workers safe during tornado clean-up and recovery operations, including available resources, see OSHA’s Tornado Preparedness and Response webpage. 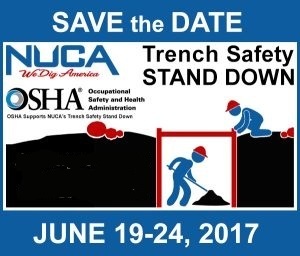 Businesses and organizations are invited to raise awareness of trenching and excavation hazards by holding a safety stand-down during the week of June 19-24. 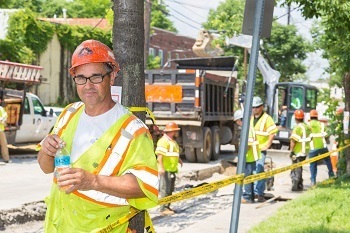 The campaign, sponsored by the National Utility Contractors Association and the Safety Ambassadors Club with support from OSHA, encourages contractors, municipalities, the military and others involved in trenching operations to temporarily stop work and offer workers education and training about trenching hazards. According to the latest available data from the Bureau of Labor Statistics, the fatality rate in the U.S. for excavation work is 112 percent higher than in general construction. Visit the Stand-Down website to learn how you can stand-down this month to save lives. Workers building a baseball stadium for the Atlanta Braves under a partnership with OSHA experienced dramatically lower injury rates than the national average. The two-year Strategic Partnership with Georgia Tech Research Institute, American Builders and the Associated General Contractors of Georgia was created to ensure the highest level of worker safety and health during construction. The partnership focused on reducing injuries and illnesses among the 6,000 workers, increasing safety and health training, sharing best practices, and ensuring employers used safety and health programs to find and fix hazards. Workers logged 5.7 million hours, resulting in only four lost-time injuries and one incident that resulted in restricted work. There would have been 52 more such injuries during a comparable number of work hours according to the national industry average calculated by the Bureau of Labor Statistics. Skanska USA and Shoemaker Construction Co. have entered into a Strategic Partnership with OSHA during a major shopping center construction project in Philadelphia. Under this partnership, OSHA will evaluate the effectiveness of the project site's safety and health program, designate an OSHA liaison to serve as a resource, meet quarterly with Shoemaker-Skanska to review project safety performance, and provide information on OSHA training resources. For more information, see Skanska’s news release. The South Texas Exploration and Production Safety Network renewed a five-year agreement to reduce employee exposure to all hazards in the oil and gas exploration and production industry. In 2016, the alliance conducted a training session focusing on silica hazards associated with hydraulic fracturing. The Hispanic Contractors Association de Tejas signed a two-year agreement to provide association members and others with guidance and training resources to help protect worker safety and health, particularly by preventing exposure to Focus-Four hazards in the construction industry. The Construction Safety Leadership Alliance signed a two-year agreement to provide CSLA members and others with guidance and training resources that will help them protect the health and safety of construction workers. The alliance will stress preventing exposure to Focus-Four hazards and establishing strong safety leadership. The Ship Workers Union Alliance signed a two-year agreement to provide union members, OSHA personnel, and others in the shipbuilding and repair industry, with safety and health training, hazard recognition skills, knowledge of OSHA's policies and procedures, and the identification and correction of hazards at the worksite through regular internal safety surveys. Williams Lumber & Home Centers is a family-run hardware and building materials chain with eight locations in the Catskill and Hudson Valley areas of New York. Last year, after working with OSHA’s On-site Consultation Program, the company’s stores in Red Hook, Hyde Park and Hudson became Safety and Health Achievement Recognition Program sites. SHARP recognizes small business employers who have used OSHA’s consultation services and operate an exemplary safety and health program. Since being involved with the On-site Consultation Program, the Hudson site realized a cost savings through a reduction in compensation claims, improved their workplace safety and health culture, and increased management and employee commitment to the safety program. For more information, see the success story. California’s Occupational Safety and Health Standards Board approved a landmark regulation May 18 to strengthen workplace safety and health at oil refineries across the state. The new regulation provides a framework to help employers anticipate, prevent and respond to hazards at refineries that can threaten workers and area residents. Among the elements outlined in the regulation to be enforced by Cal/OSHA, refinery employers are required to: conduct Damage Mechanism Reviews, conduct a Hierarchy of Hazard Controls Analysis, and implement a Human Factors Program for their worksites. For details, read the news release. OSHA inspectors conducted two separate investigations of Republic Steel, a Canton, Ohio, automotive steel manufacturer, after one worker suffered a serious injury and other workers were exposed to excessive levels of lead. Investigators determined that the maintenance worker suffered a fractured pelvis after being struck by a machine that did not have a lock-out device to prevent movement during maintenance. Other violations included failure to: implement controls to lessen exposure to steel dust; prohibit workers from eating in areas where lead exposure was possible; and replace damaged guard and stair rails. The company was cited for seven repeated and serious safety and health violations and proposed penalties totaling $279,578. Read the news release for more information. Cal/OSHA cited D&D Construction for 13 violations including failing to: ensure safe entry into a confined space; test the environment to determine if additional protective equipment was needed; and have an effective method for rescuing a worker in a confined space. Tyler Development was cited for five violations including failing to evaluate the worksite for possible permit-required confined spaces and failing to ensure the subcontractor met the requirements to comply with a permit-required program. D&D Construction and Tyler Development were proposed fines of $337,700 and $14,870, respectively. For more information, read the news release. OSHA cited Cape Romain Contractors Inc. after discovering multiple safety and health violations during a scheduled inspection of a marine terminal construction site in Mount Pleasant, S.C. Inspectors found that workers faced overexposures to silica and noise due to a lack of respiratory protection and hearing conservation programs as well as engineering/administrative controls. Cape Romain was also cited for crane, electrical, and machine guarding hazards. Proposed penalties total $81,489. A new booklet from OSHA and the Federal Communications Commission provides safety information intended to reduce injuries and fatalities among communication tower climbers and ground crew employees. The booklet compiles best practices gathered from a series of discussions involving industry stakeholders and worker safety advocates that began with a workshop in October 2014. The information is organized to appeal to specific audiences: tower climbers and ground crew employees, carriers and tower owners, turfing vendors, and tower construction and maintenance contractors. Through its alliance with OSHA, the Coordinating Committee for Automotive Repair has launched a free, online safety and health training course for automotive workers who install, activate, or charge Absorbed Glass Mat batteries. The use of AGM batteries is increasingly common as the automotive industry has evolved toward more fuel-efficient features. Sign up online to take the free course. Multiple resources for protecting workers in the high-voltage electric line construction, transmission and distribution industry have been made available through the Electrical Transmission & Distribution Partnership. A white paper, describing the partnership’s accomplishments and goals, provides best practices for keeping workers safe. The partnership website includes links to training resources and a safety app available from the Apple Store and Google Play. The National Integrated Heat Health Information System offers one-stop shopping for tips to stay healthy in the heat. The website, which includes participation from the Centers for Disease Control, the Federal Emergency Management Administration, OSHA and other federal agencies, offers forecasts, tools and resources. Targeted populations include athletes, seniors, emergency responders and outdoor workers.